Chris McGovern's blog, "The Glass"
Artiden website, "Practicing for Smooth Performances with Erica Sipes"
Valley Business FRONT magazine, pgs. 46-48, "Cobbling together a living with music"
I am primarily a pianist but also a cellist who has a passion for bringing joy, personality, and fun into making, listening to, and performing classical music. I am a freelance pianist, collaborator/accompanist, closet cellist, occasional private teacher, addicted chamber musician, and performer who is almost always willing and eager to perform with anyone who promises to try and have fun in return. I also have a love for helping people figure out more efficient ways to practice, prepare for recitals, and to accomplish their musical goals, big and small. Tell me that performing is all about perfection and virtuosic madness and I'll turn and walk away with a sigh. Tell me that it's all about sharing the magic of music and the revelation of an artist's true self and I'll smile and gladly play for you or with you. 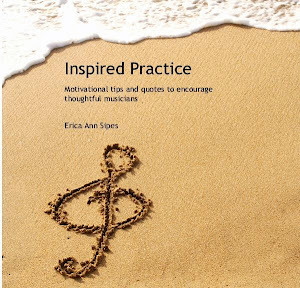 Erica Ann Sipes, pianist and cellist, received her bachelor's and master's degrees in piano performance from the Eastman School of Music where she studied with Rebecca Penneys and Nelita True. She has also studied cello with Irene Sharp and with Paul Katz and has studied piano collaboration and accompanying with Jean Barr at the Eastman School and with Anne Epperson at the Music Academy of the West. Ms. Sipes debuted with the Chamber Soloists of San Francisco at age 10 and has also performed with the Chelsea Chamber Players in Ann Arbor, Michigan. She has worked as a staff accompanist at the Bowdoin Summer Music Festival and has been to Prague and to St. Petersburg as the pianist for various choirs. Her playing has also brought her to the La Terasse Restaurant in Interlaken, Switzerland and to the Bella Voce Restaurant in San Francisco where she served as music director. She has collaborated with cellists Steven Doane, Anthony Elliott, and Erling Blondal Bengtsson. Ms. Sipes currently lives in Blacksburg, Virginia with her husband, Tadd, who runs a private voice studio. Much of her time is spent accompanying young musicians, playing chamber music with friends and colleagues in the community, and accompanying her husband. She is also an adjunct faculty member at Radford University where she teaches a piano accompanying class to non-pianists, and serves as an accompanist and coach for both singers and instrumentalists. In the summer of 2012 she officially launched her own business as a practice coach, offering coachings, workshops, planning sessions, and practice boot-camps for anyone that could use some help with practicing. Last but not least, she is also the mother of Emma Katherine, a very independent and spirited seven-year old who has decided that she would much rather do something different than following in her parents' footsteps, at least for now.